Post subject: Set up help needed please. 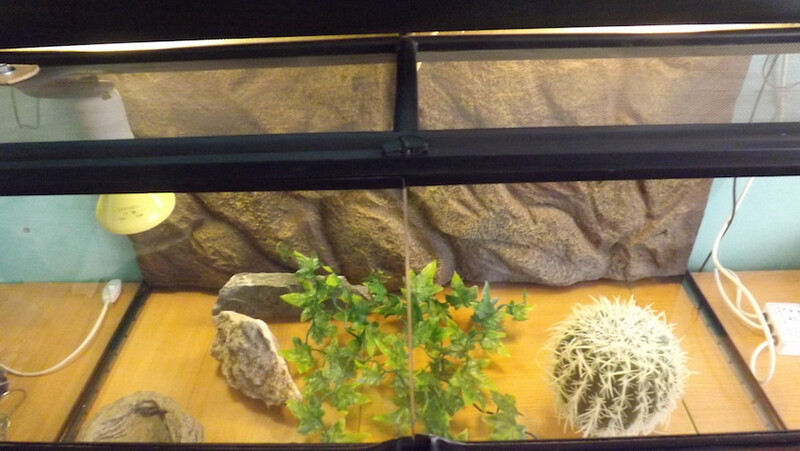 This is my 1st post so please be gentle ,I will soon be getting a baby bearded dragon for my son in about a week and yesterday i purchased a used vivarium so if i list what came with it as i'm sure everything i need is present but will need help regarding intial set-up. 150w heat bulb with black metal shade? Also i am a bit confused as why there are a total oh 6 bulbs in all and would like some advice re: the positioning of the 2 thermo sensors and the microclimate sensor? Sorry for the long 1st post and being a bit dim. 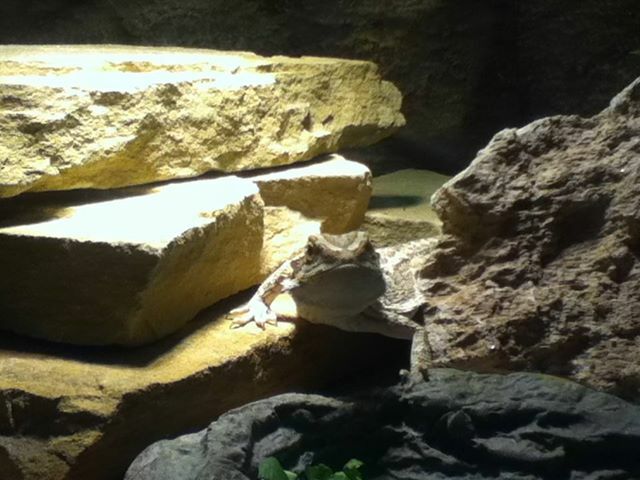 A bearded dragon needs maximum exposure to UV all the time, so a strip light is better than the sin lamps you have. 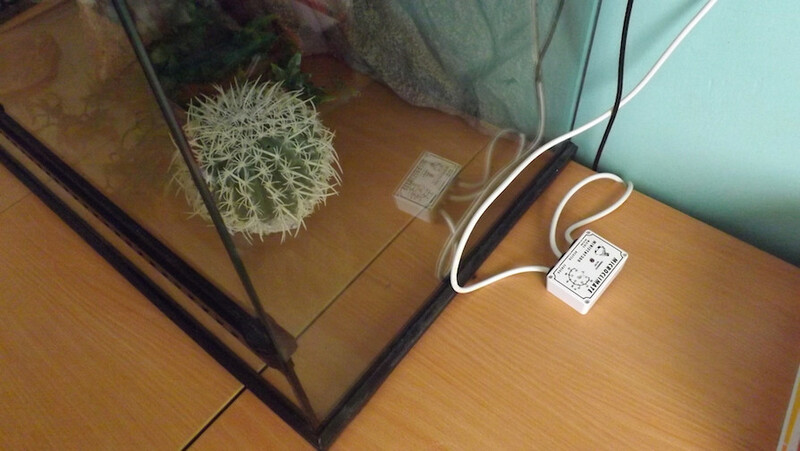 You need one bright basking light - the ceramic wont emit light and a beardie likes to bask under something bright. Ceramics are good for nightime, but not needed unless your house drops below 16 c at night. 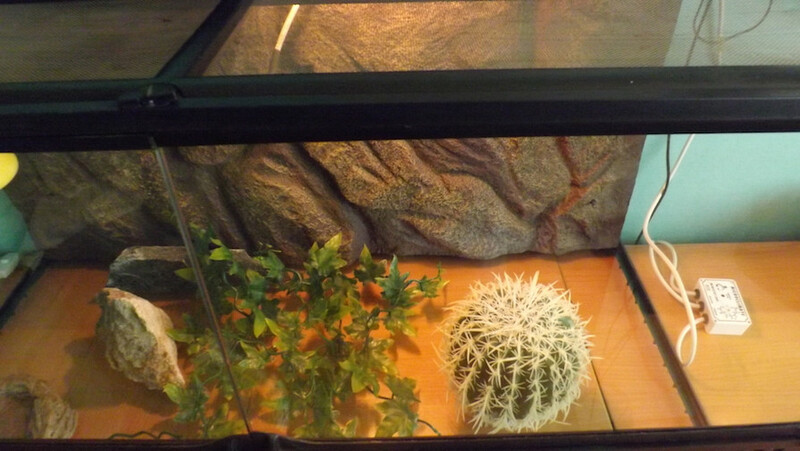 An adult beardie will need a viv thats 120 cm long, x 60 x60. I'm a bit concerned about the mesh top as you'll lose a lot of heat through this - presumably thats why the previous owner had so many lamps! Have a look at the link i posted, and then ask your next questions! Regretfully this is not an ideal set up for a dragon. These guys grow quickly and can end up around 50+ cm long so need a basic enclosure that measures 1200 x 600 x 600 if at all possible. UV is required and is best supplied by a neon tube around 900 mm. 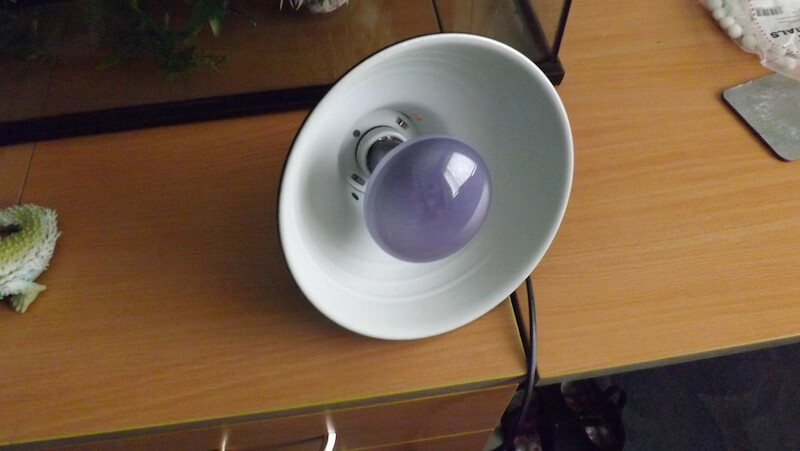 Heat light needs to be over the basking spot and honestly in the correct enclosure you will only need either a 60 or 75 watt household spotlight screwed into a ceramic fitting (ES). So a classic viv has a heat light at one end with a basking rock or branch under it, UV strip light located at that end as well. The heat light is set up through the thermostat and the sender for the thermostat is situated near the cool end. The link Trish provided then will help with getting your temps right. 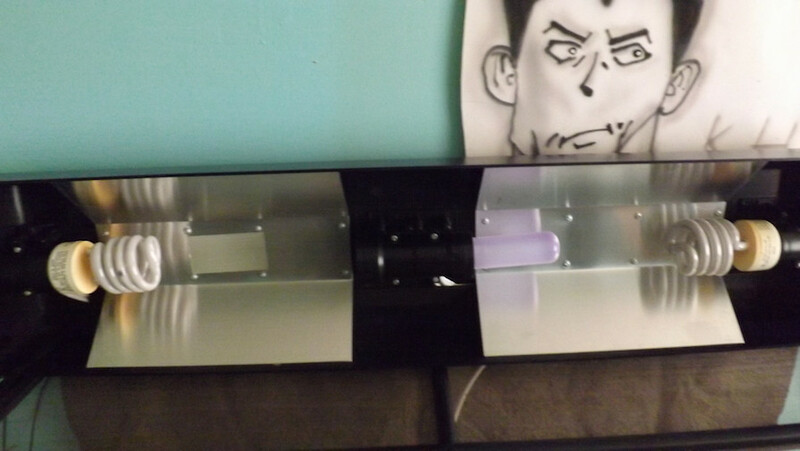 If you are still going to try using the Exo Terra enclosure you'll need to get a good 10% UV light and fitting that can be set up INSIDE the mesh, the heat light will need to be at one end with a gradient of 39~42C at the basking point dropping to mid to high 20's at the cool side. 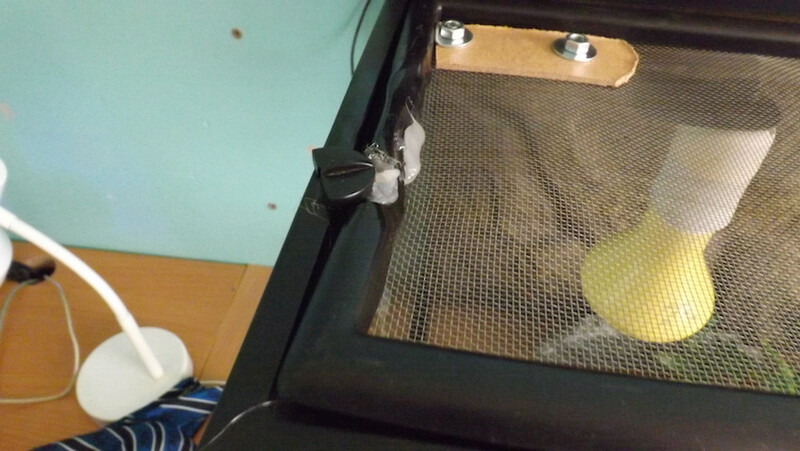 Without actually seeing all the equipment I can't be of much more help, but I would suggest waiting to get the baby until after you have your viv up and working at the correct temps. Thanks for the advice,if i post pictures of what i have presently then it may make it clearer. Last edited by carbondouble on Sat Jan 25, 2014 12:28 pm, edited 1 time in total. oops sorry pics are a bit large? Can you resize please - they're so large I can't see them!! 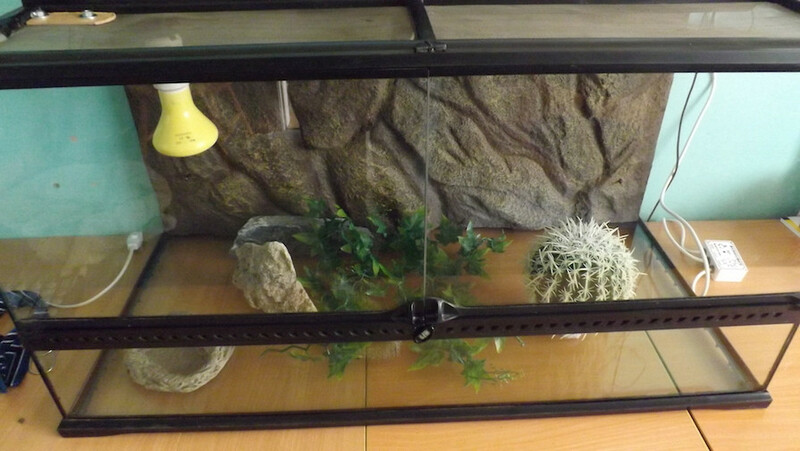 However at a guess I would set up the viv with the lamp dome on the mesh at one end with say a 75 Watt household spotlight fitted. With a digital thermometer check the temp under it (basking spot) after around an hour. Hopefully it will be around 38C or slightly higher. 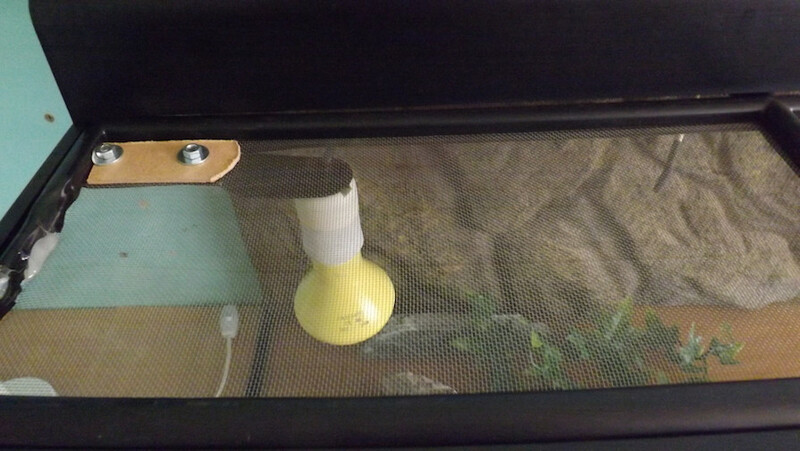 If it's lower you will need to block off the rest of the venting on the viv to try retaining the heat. Once you've tested this out we can carry on to installing/using UV lighting plus setting up the thermostat to regulate the heating. OK scratch most of the above as I managed to copy and display your photos elsewhere. First the bracket thingy with the ceramic? heater - dump the ceramic and substitute a 75 watt spot and test as above, leaving the thermostat out of the circuit. Let us know what sort of temp your getting and if it's low as I suspect it will be then cover the rest of the metal grill with a bit of card to see how that affects it. Once you've told us how this goes we can talk about updating the compact lights you've got in the hood. These will need to be 10% UV compacts to give adequate UV. Much better - now as I amended - use the bracket thingy the previous owner fitted and run a standard 75 watt RO80 spotlight to test temps as I've suggested. With the hood fitted with the compact lights - these supply the UV but as you don't know how old they are (they're only good for around 6~8 months) I'd dispose of them and fit two 10% (or better) strength UV compacts say Exo Terra or Arcadia brands. When you've tested the temps out get back on here and we'll run through any alterations you need to make to get it running properly. Thanks rick,There seems to be too much conflicting information regarding tank size/uv/lighting etc......at my local pet shop they had the ceramic (like mine) and said they were best they also had the exo terra viv (like mine again) and recommended them even for a grown dragon.......information overload,all i want is what is best for SPYRO (my son has already named him) that is why i signed up here. I tested the temps last night with my current set up and they seemed to be what are generally considered to be correct. Rick wrote: Much better - now as I amended - use the bracket thingy the previous owner fitted and run a standard 75 watt RO80 spotlight to test temps as I've suggested. With the hood fitted with the compact lights - these supply the UV but as you don't know how old they are (they're only good for around 6~8 months) I'd dispose of them and fit two 10% (or better) strength UV compacts say Exo Terra or Arcadia brands. Would the light that is in the black shade be suitable as it is a new bulb? I'm afraid the wattage is too high and you'd probably fry your baby. These are what you need either in 60 or 75 watt. http://www.mysupermarket.co.uk/asda-com ... 60w_4.html they're cheaper than "reptile" ones and do exactly the same thing! How are the temps looking in the viv? Rick wrote: How are the temps looking in the viv? Hi. under the spotlight 8" below it is were the basking stone is and its at 44 and at the cooler end its 21 but that is with a 100 watt reflector bought from pets at home so today i will pop to asda and buy a 60 watt and monitor the temps again. Don't worry too much about the cool side as your dragon will move around to find a comfortable area. Did you block the rest of the mesh off? If not, doing that and then using a 60 watt spot should bring the cool side up bit whilst maintaining a good basking temp. Whilst mid 20's on cool side is ideal it can vary up to 28C or down to low 20's as long as he can move around from hot to cooler areas. Open grid tops do make keeping temps at an even gradient quite hard which is why I'd recommend closing most of it off.